You might be saying to yourself… what is Sensei talking about? Has he eaten a bad malasada or something? What is The New Meta of Medicine #illumedati? What is “the new meta”? So “the new meta” is actually video game terminology, primarily used in League of Legends. “”Meta” is short for “meta-game”. It stands for all things that are part of how people usually play the game (at any given time), but are not necessarily rules of the game. Ok… ummm… so…? What does that have to do with medicine? Well… I’m going to make to do a few calculations and make some generalizations, which is, in general, a bad thing. However, please bear with me. 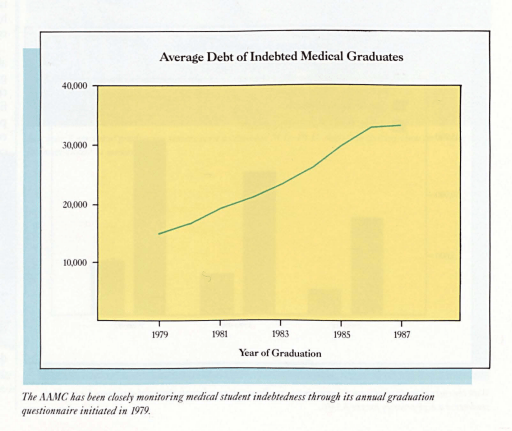 Average medical school debt according to 1986-1987 AAMC Report, ~ 30 years ago was ~$15000 in 1979 rising to ~$33000 in 1987. So, $15000 in 1979 and $33000 in 1987. However, in order to make an apples to apples comparison, we need to account for inflation in 2016 dollars. So doctors graduating in 1979 saw about the equivalent of $50k in student loan debt, and those in 1986 saw the equivalent of $72k. According to AAMC, the average medical student loan debt in 2016 is a mean of $189,000 and median of $190,000. So basically, more than 3x more than 1979 and 2x more than 1986. Ok, now let’s dig deeper… what about salaries? 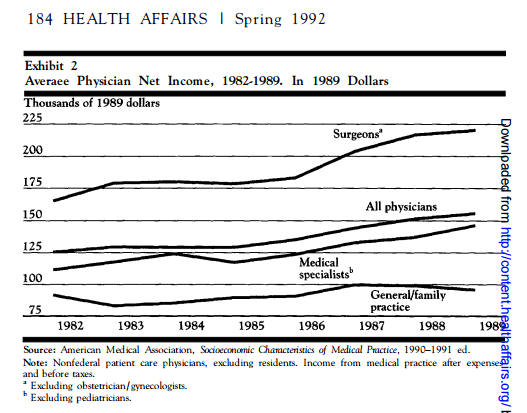 According to this Health Affairs Spring 1992 Report, the average income for physician in 1986 was about ~$140,000. On the same graph, approximating for general practitioners (~$90,000), specialists (~$125,000) and surgeons (~$187,000). What if we approximate for inflation? Those numbers are in the “general ballpark” as the actual numbers I think, although the surgeon number is kind of high for general surgeons. Like I’ve said before, I thought medical school loan debt had increased whereas salaries have basically just kept up with inflation. I’ve just never calculated it before today. As such, the external factors of the game have changed. Previously, if you were a doctor who graduated in 1979 or 1986, you could probably afford to make a few mistakes. Maybe you were Dr. Yoloswag for a few years, and started your retirement 5 or 10 years late. However, you likely were able to pay off your medical school loans will maintaining a very comfortable lifestyle because your debt to income ratio was relatively low. And then even after starting retirement late, you were probably still ok and could make up for some lost time. However, you may meet some doctors who graduated in 1986, who have been practicing for 25+ years now and want to retire, but can’t. Please don’t do that. You can’t afford to make those mistakes anymore. This is “the new meta of medicine”. Is there a difference in interest rates? Unfortunately, I can’t find any good data on what the interest rates for the 1986 debt was. If someone who graduated from medical school around that time could tell me what interest rate they paid, and if they had the ability to refinance, that would be very helpful. Please let me know. 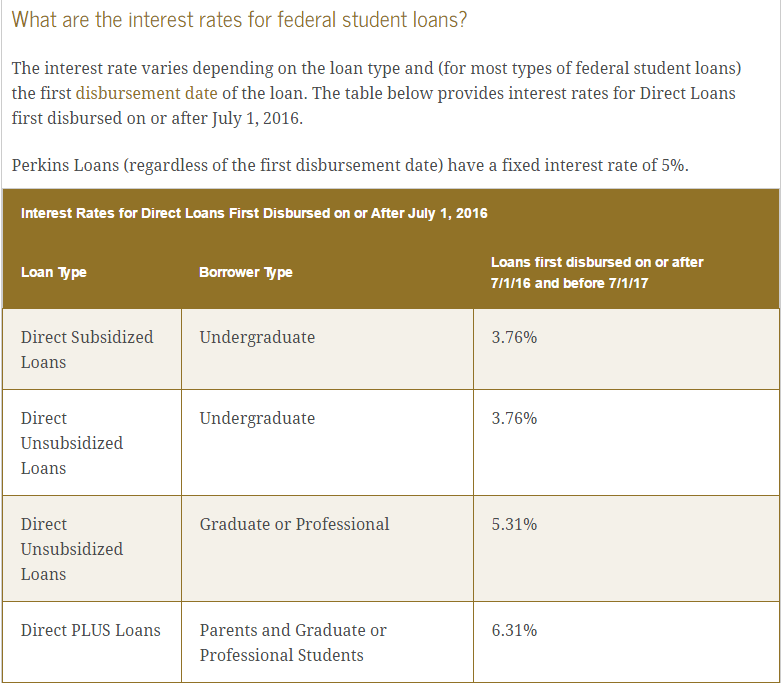 I think most medical students will need to use both Direct Unsubsidized Loans and Direct PLUS Loans. Please correct me if I’m wrong. It’s not a big deal if you pay it all off quickly and it’s just 2x or 3x more debt… but the interest compounds. Remember what I said about compound interest, you either earn it or you pay it. So let’s see 1986 versus 2016 paying off loans. Let’s even say they’re both 6% interest for simplicity’s sake. So for 1986, it’s $72264 debt and for 2016 it’s $190,000 debt. So it’s a little more debt… but you have to pay a lot more money to pay it off. So if you pay over 10 years, you’d save ~$20k. If over 20 years you’d save ~$50k. And if over 30 years, you’d save ~$84k. Ideally, you would pay off your loans as soon as possible… but that depends on your risk tolerance. This is the new meta of medicine. After you find out where you match this year, you must think about and prioritize your retirement as soon as you finish medical school. You don’t have the luxury of waiting a few years to figure things out. You need to hit the ground running and plan for your retirement during residency, preferably during internship… or even as a 4th year medical student, although it may be difficult without having your loans refinanced yet. For this reason, I recommend doing your best to put as much money into a Roth 401k/403b during Residency as you can. You will have your student loan exit interview where they will counsel you on how much you owe and how to pay it, etc. etc. Wait a second… how can I pay off my loans as soon as possible and also save for retirement? You will have to do some portion of both. Which you prioritize, you will need to decide based on your risk tolerance. If you believe in index funds and compound interest, then it is reasonable to pu t away as much money away into your Roth 401k/403b in Residency as much as possible instead of putting that extra money toward loans. However, this makes the assumption that your loans have been refinanced at a reasonable rate, like 4% or less. For others, you may just want to get rid of your loans as soon as possible because you dislike the debt hanging over your head. This is an admirable goal, but I caution you that it may be difficult to make any significant dent in your student loans during residency on your resident’s salary. The only caveat to this is if you are able to save money from not paying rent or can make extra money moonlighting. As a default plan, I would advise putting $100 of your bi-weekly paycheck into a Roth 401k/403b when you do your internship paperwork… unless you matched into a high cost of living area such as New York City or San Francisco, and will need to live month to month. After taking stock of your budget a few months into internship, you can consider increasing it to $200 (or more), or paying more toward your loans, whichever you are more comfortable with. Then as an attending, you should at bare minimum max any matched 401k/403b. Then, set up your loan repayment plan (you might even refinance again if rates are favorable). After that, you can decide whether you want to maximize your 401k/403b and 457 (if available) and do a Backdoor Roth IRA, or if you just want to put any and all extra money toward your loans. Higher student loan debt, even when adjusted for inflation. Stable salaries, when adjusted for inflation. Compound interest on the higher debt places us further behind those who came before us. We must prioritize retirement from the outset. There is no time to wait and no room for mistakes. Refinance your student loans. Utilize your Roth 401k/403b in Residency. Well? What do you think about The New Meta of Medicine? Does it make sense? Did I mess up the math somewhere? Did I miss some other external factor?